A baby cannot get through the pelvis if the baby can’t get into the pelvis. Lack of engagement is a common issue for the woman who labors but the baby remains high in the pelvis. For about half the cases, the uterus gets overworked trying to get a baby into the pelvis for days of labor. A common obstetrical solution is to do a cesarean. The baby’s little forehead may be felt resting on top of the pubic bone like a small ledge. Spinning Babies offers a few simple engagement techniques that can be done in labor over the course of an hour or so. Some are easy to do, some are challenging. But once they are done, the labor is very, very likely to progress. And sometimes, the labor will even finish quite quickly with suddenly less pain than before engagement. In fact, learning how to help baby engage can save hours and even days of labor. Check this out. What does labor look like when the baby isn’t engaged? Early labor can go on for a day, or two or three. Sometimes the woman thinks her starter is broken. 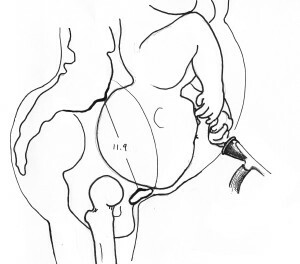 This is because the labor can start and stop as the baby tries to get into the pelvic brim. Women may not dilate beyond 3 cm when the baby remains high. Labor can feel so strong as the uterus works hard to rotate baby’s head to drop into the pelvis. These strong contractions can go on for days. Once baby engages labor becomes effective and the baby is born in 8 hours or less. Other times, labor seems to begin and progress normally until a labor stall occurs in active labor or even pushing. In this case, labor started without stops and starts. The baby remains high during the stall in this case. When baby is not engaged the baby is -3 or -2 station. Not all unengaged labors have these characteristics, but these are quite common. Ten contractions in a row doing the Abdominal lift may be the most effective technique during contractions. Sitting on a firm birthing ball and doing rather rapid hip circles (hoola hoops) or figure “8s” especially if there are no contractions. Dip the Hip is perhaps an alternative if no ball is available. Open-knee stretch in the pool (Inverted Walcher’s in the pool during 3 contractions). Again, helping baby rotate to the LOT, LOA, or OA fetal positions so the head fits more readily, and helping the baby tuck his chin with the abdominal lift and with circles on a birthing ball. What will labor look like when the baby is finally engaged after this kind of start? 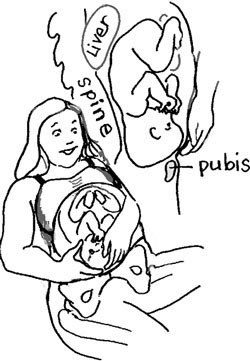 Once the baby engages, perhaps because the baby rotated and dropped into the pelvis, then the labor often seems to stall. In this case, this is no problem. The uterus is resting. The mother can rest too, as long as her and baby’s vital signs are good. Once the uterus is rested and the mother fed and slept, the labor will pick up. It won’t seem as painful as it starts up again and the contractions will be more manageable. Then they will get closer and longer lasting and the cervix will open in response this time. Things will be more predictable and as expected when the baby’s chin is tucked and the head fits the pelvis better. Be Alert! When the cervix is fulling open and you find the baby is still high at -3 Station, your techniques to “engage” the baby may bring the baby all the way through the pelvis in a very short time. Be ready! Why does labor seem to stop once the baby is engaged? Contractions change from being quite strong, long, close together and painful to calmer with a strength that matches dilation, so to speak. Labor may seem to stall if the uterus has already been working hard and long. In this case, this is no problem. The uterus is resting. The mother can rest too, as long as her and baby’s vital signs are good. Labor could pick up quickly, more easily and with a lot of low pressure. Once the uterus is rested and the mother fed and slept, the labor will pick up. Labor won’t seem as painful as it starts up again and the contractions will be more manageable. Then they will get closer and longer lasting and the cervix will open in response this time. Labor progress will be more predictable and as expected when the baby’s chin is tucked and the head fits the pelvis better. Baby can sometimes get stalled on another part of the pelvis. If the baby drops but the chin remains up, though the baby is coming down, the labor might still take a long time, depending on pelvic shape. We may then have to help open the midpelvis (ischial spines) and outlet. If baby is -1,0, or +1 station, then the baby is engaged but stuck in the midpelvis and you would do a Sidelying Release followed by side lunges for either a Transverse Arrest or an Asynclitic baby.) 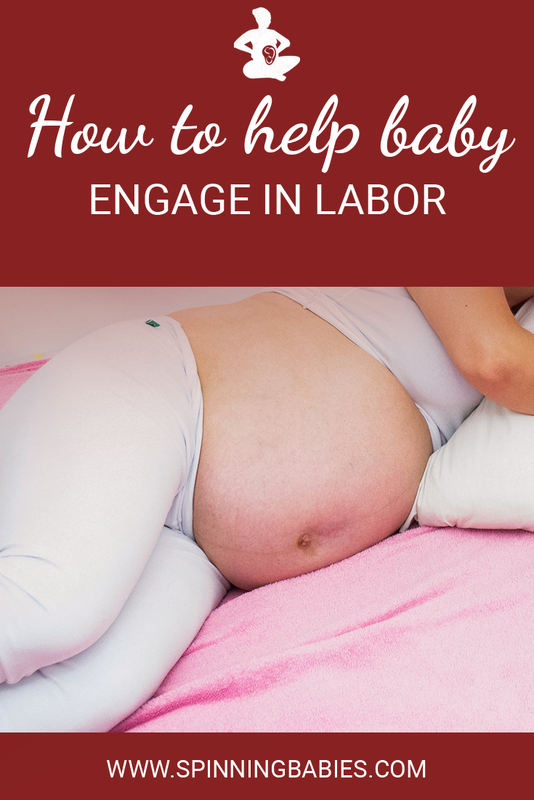 The lunge is a wonderful technique for helping the baby when labor stalls at 0-station or below. The Hip Press and internal rotation of the femur as the mother, starting on hands and knees, lifts and rests her leg up over a peanut ball or somewhat deflated birth ball. If the baby drops but the head is tipped, as if the baby is listening to the outside world, in an asynclitic position, then the labor will remain long. Opening the midpelvis the head to pass through helps (lunge, sidelying release). See the article on asynclitism in Baby Positions. Babies naturally engage in the pelvis when the broad ligament is soft enough and the brim open enough. Fetal chin tucking and coming down from the mother’s left side helps more babies fit more mother’s inlets. Generally, we hope for flexion and rotation before engagement. This is most important when we find baby in the posterior position and high after 38 weeks. Dip the Hip may be a good, specific technique. Work on Balance before working on rotation and descent. Though, sometimes we have a time issue, as when a woman’s membranes have released and when her provider has a time limit for her labor. Descent from a non-optimal position may have additional challenges that may be met with maternal positioning and activities in labor. Doing balancing activities first will ease the coming active phase of labor.